To Cite: Eslami E, Mohammad Alizadeh Charandabi S, Farshbaf Khalili A, Asghari Jafarabadi M, Mirghafourvand M. The Effect of a Lifestyle-Based Training Package on Weight Gain and Frequency of Gestational Diabetes in Obese and Overweight Pregnant Females, Iran Red Crescent Med J. 2018 ; 20(S1):e62576. doi: 10.5812/ircmj.62576. Background: Obese and overweight females require proper programs for moderating and regulating their weight gain during pregnancy and preventing gestational diabetes. Objectives: The aim of this study was to determine the effect of a lifestyle-based training package on weight gain and frequency of gestational diabetes in obese and overweight pregnant females. Methods: This randomized controlled trial was conducted on 140 obese and overweight pregnant females in Tehran, Iran. The training program administered to the intervention group consisted of a 60- to 90-minute session of group training using lectures, booklets, and text messages. A 2-hour 75 g oral glucose tolerance test (OGTT) was performed to screen for gestational diabetes at 24 to 28 weeks of gestation, and gestational diabetes was diagnosed based on the obtained results. The weight increase was calculated 8 weeks after the intervention compared to the beginning of the study. Results: The test results of fasting blood sugar (FBS) and glucose tolerance test (GTT) showed 15 cases of gestational diabetes in the intervention group and 17 in the controls after the intervention, suggesting no statistically significant differences between the 2 groups (P = 0.687). Moreover, based on analysis of covariance (ANCOVA) and with adjusting the baseline values, the mean weight gain was found to be 3.4 kg in the intervention group and 3.8 kg in the control group, suggesting no statistically significant differences between the 2 groups after the intervention (P = 0.634). Conclusions: Although the frequency of gestational diabetes was found to be higher in the intervention group than in the controls, the difference was insignificant possibly due to use of a small sample size. Further studies are therefore recommended to be conducted using larger sample sizes. Obesity constitutes a major health concern in countries across the world, including Iran (1). Recently, conducted studies have shown that growth in the prevalence of obesity and overweightness has reached an alarming level (2), such that almost 50% of females, who become pregnant have an abnormal weight (3). In 2013, the prevalence of obesity and overweightness in 20- to 84-year-old Iranian urban females was reported as 36.9% and 20.6%, respectively (4). Undesirable outcomes become more prevalent in the mother and infant with an increase in maternal Body Mass Index (BMI) (5, 6). Maternal complications caused by obesity and overweightness include increased risk of gestational hypertension and preeclampsia, gestational diabetes, the need for induced labor, perinatal mortality, thromboembolic diseases, intrauterine fetal death, increased rate of cesarean, increased rate of miscarriage, increased rate postpartum hemorrhage and infections, etc. (7-9). It has further been proposed that congenital anomalies, such as spina-bifida, cardiovascular abnormalities, cleft lip and palate and finger anomalies, are more likely in females with an abnormal BMI compared to females with a normal weight, and the likelihood of delayed onset of spontaneous breathing, increased need for invasive neonatal care, treatment of jaundice and hypoglycemia and increased frequency of birth weight over 4 kg is greater in infants born to mothers with an abnormal BMI (1, 6, 10, 11). Maternal weight gain during pregnancy is a valid indicator for controlling the mother’s nutrition status (12). In 2009, the American Academy of Medicine’s recommendation for a standard pregnancy weight gain based on the mother’s BMI was 7 kg to 11.5 kg for overweight females and 5 kg to 9 kg for obese females (13). A standard weight gain during pregnancy is one of the main factors associated with pregnancy and delivery outcomes (14, 15). Some studies have demonstrated a relationship between nutrition factors and gestational weight gain (16), whereas most studies have emphasized on the relationship between nutrition factors and pregnancy outcomes (17, 18). Recent review articles showed that gestational weight gain as per the American Medical institute is associated with the best outcomes in mothers and infants, and that this weight gain does not harm the mother or infant in any way (13). Excessive gestational weight gain is associated with several neonatal complications, such as a lower 5-minute Apgar score, hypoglycemia, polycythemia, meconium aspiration syndrome, increased rate of cesarean, hemorrhage during labor, and labor and childbirth complications (11, 19-21). Gestational diabetes is a major complication of obesity and overweightness in pregnant females, which is defined as impaired glucose tolerance and develops or is first diagnosed during pregnancy. This condition can cause unfavorable outcomes in mothers and infants during pregnancy, childbirth, and the postpartum period (22). The prevalence of gestational diabetes has been significantly growing in both developed and developing countries and reported to range between 1% and 14% across the world (23). The results of a systematic review and meta-analysis from Iran estimated its prevalence at 3.4% (24). The maternal complications include increased risk of contracting type 2 diabetes, hypertensive disorders, infectious complications, metabolic syndrome, cardiovascular diseases, and increased frequency of C-section and labor induction (25-28). The newborns of these mothers are at risk of macrosomia, shoulder dystocia, birth injury, hypoglycemia and prematurity, and at older ages, they are at risk of overweightness, impaired glucose tolerance, and obesity (29-31). Overweight and obese mothers therefore require to be taken care of more intensely and their weight gain should be controlled during pregnancy, and their risk of gestational diabetes must be prevented (32, 33). Lifestyle interventions for obese and overweight pregnant females to prevent excessive gestational weight gain and gestational diabetes could involve nutritional behavior modification through calorie limitation and the performance of regular physical activities, such as walking (3). Furthermore, physical exercise can significantly reduce the risk of macrosomia and gestational diabetes. Obese and overweight females require specific planning to regulate their gestational weight gain (34). Health education is communicated in different ways in the modern age. Group training classes are considered one of the most effective and accessible methods for pregnant females. Educational booklets also offer an effective educational tool for pregnant females in line with the society’s culture and the available facilities. Cellphone services, such as text messaging (SMS) can also offer a good and low-cost health promotion method that can help prevent unhealthy behaviors (35). Previous studies have revealed greater care that should be considered in providing prenatal care to obese and overweight females and a systematic review also stressed the need for further studies on health-related behaviors. In view of these findings and given the adverse pregnancy, childbirth, and neonatal outcomes caused by overweightness and obesity (11), and also since the review of literature showed no studies in Iran on the effect of lifestyle training interventions on obese and overweight pregnant females, the present study was conducted to determine the effect of lifestyle training on weight gain and frequency of gestational diabetes in obese and overweight pregnant females. The present study was part of a randomized controlled clinical trial with a secondary objective of investigating weight gain and the frequency of gestational diabetes. This study was conducted on 140 obese and overweight pregnant females, who visited health centers of Tehran, Iran. The inclusion criteria were age of 18 and older, gestational age of 16 to 20 weeks, minimum secondary school education, singleton pregnancy without complications, the pregnancy being the female’s first, second or third, BMI over 25 based on the prenatal care records or according to the first trimester’s weighing, willingness to participate in the study, and owning a cellphone. The study exclusion criteria were a diagnosis of physical or mental illness in the mother, maternal diabetes, following a specific dietary regimen, history of hospitalization in the current pregnancy, change of residence over the course of the study, separation from the spouse, being at risk of preterm childbirth, addiction or habitual use of drugs and alcohol, a history of infertility and the use of assisted reproduction techniques, and the death of close relatives, divorce or other acute emotional problems over the past month. The sample size was calculated as 70 for each group using the G-Power software and based on a study by Shakeri et al. (36). Considering m1 = 12.76, assuming a 20% increase in physical activity following the intervention (m2 = 15.31, sd1 = sd2 = 4.37), and considering a 95% confidence interval and a 90% test power, the minimum sample size was estimated as 63 per group, which was increased to 70 per group considering a potential attrition of 10%. Sampling was conducted from July 2016 to December 2017 after obtaining approval from the ethics committee of the research and technology deputy of Tabriz University of Medical Sciences with the following code IR.TBZMED.1385.70; the trial was registered in the Iranian registry of clinical trials (IRCT) website under the code IRCT2016041210324N31. Sampling was conducted at 12 health centers of Tehran that covered at least 12 eligible females. A list was prepared at each center of 16- to 20-week pregnant females with a BMI > 25, based on their prenatal care records or according to the first trimester’s weighing. These eligible females were contacted and those willing to participate were briefed on the study and invited to take part. They were ensured of the voluntary nature of participation before submitting their informed written consents. At the beginning of the study, all the participants in the control and intervention groups were weighed using the same standard scale (Seca, Germany). All the participants were weighed with bare feet and the least clothing. The scale accuracy was confirmed in every instance of weight measurement using a 500-g weight. The height of the participants was also measured using a tapeline (Laica, Italy) with an accuracy of 1 cm, while standing beside the wall with bare feet and normal shoulder positions, and their BMI was also calculated. Based on the inclusion criteria, none of the participants in the intervention and control groups had diabetes. Socio-demographic and obstetrics questionnaires were then completed by the participants. Participants were assigned to the intervention (receiving lifestyle training offered by the researcher) or the control group, using randomized blocks with block sizes of 4 and 6 and allocation ratio of 1:1 and stratification by health centers. Both groups received routine pregnancy care provided by the health centers’ medical personnel, which included supplementation, nutrition, routine tests, weighing, risk assessment, and education and other pregnancy care services. Blocking was carried out by someone not involved in the sampling process and the type of intervention given was written on pieces of paper, placed in opaque envelopes, and numbered consecutively (allocation concealment). Since the intervention was training-based, blinding the researcher and participants was not possible, and only the data analyzer was blinded. Relevant topics were taught to the females in the intervention group in the form of a 60- to 90-minute group session, and a half-hour question and answer (Q and A) session was held after the training. The participants were given 2 phone numbers to contact if they had any questions. A booklet was also distributed among the females in the intervention group after the training session was over, and the booklet was also given to the control group once the intervention was over and the results had been assessed. The content of this educational booklet was developed following a review of the literature on nutrition and physical activity in obese and overweight females and also according to the world health organization (WHO) recommendations and the ministry of health advices. In the 4 weeks following the training session, educational text messages were sent to the mothers in the intervention group every other day. Eight weeks following the beginning of the intervention, necessary arrangements were made with all the participants through phone calls and their weight was measured again. After interpreting the results of the fasting blood sugar (FBS) test and glucose tolerance test (GTT) conducted in all the participants at 24 to 28 weeks of gestation, their diabetes status was determined. Data were collected using socio-demographic and obstetric questionnaire, standard scale (Seca, Germany), tapeline (Laica, Italy), and test results of FBS and GTT. The socio-demographic and obstetric questionnaire contained items on the mother’s age, age at marriage, weight, height, diabetes status, own and spouse’s education, own and spouse’s occupation, adequacy of income and housing status, gravidity and parity, history of miscarriage and stillbirth, history of fetal death, history of preterm childbirth, and history of abnormal birth. To determine reliability of the FBS and GTT tests, 2 blood samples were obtained from 10 pregnant females and both samples were labeled differently. Results were assessed based on Pearson’s correlation coefficient and a correlation of 1 was calculated. The content validity method was used to confirm the validity of this questionnaire. For this purpose, after developing the final questionnaire, the comments of 10 faculty members of the Nursing and Midwifery school were used to modify the questionnaire. Data were analyzed using SPSS 24. Normality of the quantitative data was confirmed using the K-S test. The Chi-square test and analysis of covariance (ANCOVA) test was used to compare frequency of gestational diabetes and weight gain between the 2 groups. All analysis were done based on intention-to-treat. P values of < 0.05 were considered as the level of statistical significance. Participant recruitment and follow-up were conducted from April 6th, 2016 to February 21st, 2017. A total of 650 females were assessed in terms of their eligibility and 480 of them did not meet the inclusion criteria; 140 females were ultimately included in the study and assigned to the intervention and control groups. No attrition was observed in any of the groups (Figure 1). The mean (SD) age was 25.27 (4.67) years in the intervention group and 28.88 (5.58) years in the control group. The mean (standard deviation) BMI of the subjects was 28.72 (2.97) in the intervention group and 28.27 (3.42) in the control group. The majority of mothers in both the education group (94.3%) and the control group (95.7%) were housewives. Almost one-third of the females and their spouses had only a high school diploma in both groups. With the exception of the spouse’s job (P = 0.027), gravidity (P = 0.036), and the pre-intervention BMI (P = 0.003), there were no significant differences between the 2 groups in terms of their other demographic details (P > 0.05) (Table 1). According to the independent t-test, no statistically significant differences were observed between the 2 groups in terms of FBS (P = 0.505), 1-hour GTT (P = 0.605) and 2-hour GTT (P = 0.903). The test results of FBS and GTT showed 15 cases of gestational diabetes in the intervention group and 17 in the controls after the intervention, suggesting no statistically significant differences between the 2 groups (P = 0.678) (Table 2). bMean difference (95% confidence interval). Before the intervention, the mean weight was found to be 76.7 kg in the intervention group and 71.5 kg in the control group (mean difference: 5.24; confidence interval 95%: 1.8 to 8.6; P = 0.003). After the intervention, the mean weight was found to be 80.1 kg in the intervention group and 75.3 kg in the controls (adjusted mean difference: -0.20; confidence interval 95%: -0.1 to 0.6; P = 0.634). Moreover, based on ANCOVA and weight control before the intervention, the mean weight gain was found to be 3.4 kg in the intervention group and 3.8 kg in the control group, suggesting no statistically significant differences between the 2 groups after the intervention (Table 3 and Figure 2). cIndependent T-test was used for comparison of the groups before intervention. dANCOVA test was used for comparison of the group after intervention with adjusting the baseline values. Education is a process that provides knowledge and motivation for people to adopt and maintain healthy behaviors and correct lifestyles (37). Previous studies have revealed that according to adverse pregnancy, childbirth, and neonatal outcomes caused by overweightness and obesity, greater care should be taken of these females (38, 39). The results of the present study showed that no statistically significant differences are observed between the 2 groups in terms of developing gestational diabetes and mean gestational weight gain after the intervention. Guelinckx et al. found that training does not affect the mean post-intervention weight gain in mothers (40). Dodd et al., who investigated the effect of teaching lifestyle to obese and overweight mothers, found that the training program does not affect the overall weight gain of the mothers (6). Similarly, Asbee et al. showed that lifestyle and nutrition training programs do not reduce the prevalence of gestational diabetes in the intervention group (41). The results of studies are consistent with the present study results, indicating the ineffectiveness of lifestyle training programs in reducing the prevalence of gestational diabetes and weight gain. The results of a study conducted by Zandinava et al. showed that self-care education improved self-care behavior in females with gestational diabetes and it was also effective in impaired glucose tolerance (42). The results of Zandinava et al.’s study is inconsistent with the results of the present study. This discrepancy may be due to the difference of samples and educational contents among the 2 study. Garnaes et al., who investigated the effect of sports training and weight gain on obese pregnant females, made evaluations in 3 stages, including 12 to 18 weeks of gestation, 34 to 37 weeks of gestation, and upon childbirth. They showed that the mean weight gained from the basic assessment to childbirth was significantly lower in the intervention group compared to the control group. They also reported significantly lower prevalence of gestational diabetes in the intervention group compared with the controls (43). Asci et al. revealed that lifestyle interventions during pregnancy significantly increase the likelihood of weight gain being standard, proportional with the mother’s BMI (44). Wang et al. (2017) investigated the effect of regular exercise in early pregnancy to prevent gestational diabetes in Chinese overweight/obese pregnant females. The results showed that females in the intervention group had significantly less gestational weight gain by 25 gestational weeks and at the end of pregnancy, and reduced insulin resistance levels at 25 gestational weeks (45). The results of the above-mentioned studies are inconsistent with the results of the present study. This discrepancy may be due to the difference of intervention type and duration. Given the short duration of the training intervention and the need for more prolonged assessments, the present results could be used to assess the study outcomes up to the end of pregnancy. Moreover, despite holding the training programs, fear and anxiety in the pregnant females caused by the complications of physical exercise and other teachings during pregnancy, including abortion, preterm delivery, and its associated difficulties, could be considered a reason for the ineffectiveness of the intervention. The strengths of the present study include its compliance with all the principles of clinical trials, such as random allocation and allocation concealment, and also the lack of attrition, the outcomes being objective and visible, and the data analyzer having been blinded. The limitations of the study include the small sample size and the study of only low-risk obese and overweight pregnant females, which limits the generalization of the results to high-risk obese and overweight pregnant females. Further studies are recommended to be conducted on this subject with larger sample sizes. Although the frequency of gestational diabetes cases and weight gain were found to be higher in the intervention group than in the controls, the difference was insignificant, possibly due to using a small sample size. Further studies are therefore recommended to be conducted using larger sample sizes. Furthermore, given that the training program covers only 4 weeks of pregnancy, training associated with proper nutrition and the necessity of physical exercise in obese and overweight pregnant females are recommended to be presented with the onset of pregnancy and continued for longer durations to prevent gestational diabetes and control weight gain. The authors would like to thank the research deputy, school of nursing and midwifery, and student research committee of Tabriz University of Medical Sciences, as well as the participants and Tehran health care personnel. Authors’ Contribution: Elham Eslami made a substantial contribution to the conception of the study, the recruitment of females and the data collection, and drafted the manuscript. Mojgan Mirghafourvand was involved in the design of the study and performed the analysis. Mojgan Mirghafourvand, Sakineh Mohammad Alizadeh Charandabi, Azizeh Farshbaf Khalili and Mohammad Asghari Jafarabadi supervised the study and made a substantial contribution to the conception of the study. All authors revised the article, and gave their comments and approved the final version. Conflict of Interests: There were no conflicts of interest. 1. Dombrowski SU, Avenell A, Sniehott FF. Behavioural interventions for obese adults with additional risk factors for morbidity: systematic review of effects on behaviour, weight and disease risk factors. Obes Facts. 2010;3(6):377-96. doi: 10.1159/000323076. [PubMed: 21196792]. 2. Boggs DA, Rosenberg L, Cozier YC, Wise LA, Coogan PF, Ruiz-Narvaez EA, et al. General and abdominal obesity and risk of death among black women. N Engl J Med. 2011;365(10):901-8. doi: 10.1056/NEJMoa1104119. [PubMed: 21899451]. 3. Dodd JM, Kannieappan LM, Grivell RM, Deussen AR, Moran LJ, Yelland LN, et al. Effects of an antenatal dietary intervention on maternal anthropometric measures in pregnant women with obesity. Obesity (Silver Spring). 2015;23(8):1555-62. doi: 10.1002/oby.21145. [PubMed: 26175260]. 4. Moghimi-Dehkordi B, Safaee A, Vahedi M, Pourhoseingholi A, Pourhoseingholi M, Ashtari S, et al. Overweight and obesity and related factors in urban Iranian population aged between 20 to 84 years. Ann Med Health Sci Res. 2013;3(2):171-6. doi: 10.4103/2141-9248.113656. [PubMed: 23919184]. 5. Ehrenberg HM, Durnwald CP, Catalano P, Mercer BM. The influence of obesity and diabetes on the risk of cesarean delivery. Am J Obstet Gynecol. 2004;191(3):969-74. doi: 10.1016/j.ajog.2004.06.057. [PubMed: 15467574]. 6. Dodd JM, Turnbull D, McPhee AJ, Deussen AR, Grivell RM, Yelland LN, et al. Antenatal lifestyle advice for women who are overweight or obese: LIMIT randomised trial. BMJ. 2014;348:g1285. doi: 10.1136/bmj.g1285. [PubMed: 24513442]. 7. Cedergren MI. Maternal morbid obesity and the risk of adverse pregnancy outcome. Obstet Gynecol. 2004;103(2):219-24. doi: 10.1097/01.AOG.0000107291.46159.00. [PubMed: 14754687]. 8. Fretts RC. Etiology and prevention of stillbirth. Am J Obstet Gynecol. 2005;193(6):1923-35. doi: 10.1016/j.ajog.2005.03.074. [PubMed: 16325593]. 9. Choi J, Fukuoka Y, Lee JH. The effects of physical activity and physical activity plus diet interventions on body weight in overweight or obese women who are pregnant or in postpartum: a systematic review and meta-analysis of randomized controlled trials. Prev Med. 2013;56(6):351-64. doi: 10.1016/j.ypmed.2013.02.021. [PubMed: 23480971]. 10. Ovesen P, Rasmussen S, Kesmodel U. Effect of prepregnancy maternal overweight and obesity on pregnancy outcome. Obstet Gynecol. 2011;118(2 Pt 1):305-12. doi: 10.1097/AOG.0b013e3182245d49. [PubMed: 21775846]. 11. Cnattingius S, Bergstrom R, Lipworth L, Kramer MS. Prepregnancy weight and the risk of adverse pregnancy outcomes. N Engl J Med. 1998;338(3):147-52. doi: 10.1056/NEJM199801153380302. [PubMed: 9428815]. 12. Thorsdottir I, Torfadottir JE, Birgisdottir BE, Geirsson RT. Weight gain in women of normal weight before pregnancy: complications in pregnancy or delivery and birth outcome. Obstet Gynecol. 2002;99(5 Pt 1):799-806. doi: 10.1097/00006250-200205000-00021. [PubMed: 11978290]. 13. 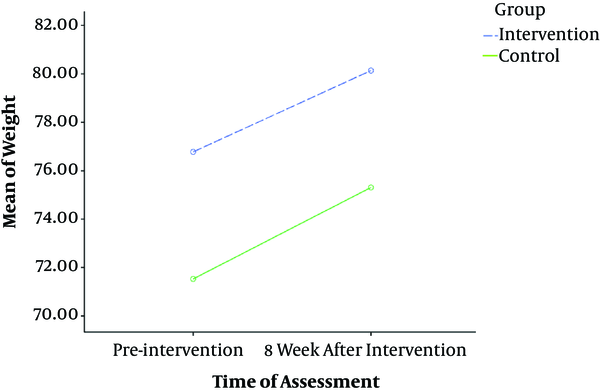 Furber CM, McGowan L, Bower P, Kontopantelis E, Quenby S, Lavender T. Antenatal interventions for reducing weight in obese women for improving pregnancy outcome. Cochrane Database Syst Rev. 2013;(1). CD009334. doi: 10.1002/14651858.CD009334.pub2. [PubMed: 23440836]. 14. Abrams B, Carmichael S, Selvin S. Factors associated with the pattern of maternal weight gain during pregnancy. Obstet Gynecol. 1995;86(2):170-6. doi: 10.1016/0029-7844(95)00119-C. [PubMed: 7617345]. 15. Shapiro C, Sutija VG, Bush J. Effect of maternal weight gain on infant birth weight. J Perinat Med. 2000;28(6):428-31. doi: 10.1515/JPM.2000.056. [PubMed: 11155426]. 16. Lagiou P, Tamimi RM, Mucci LA, Adami HO, Hsieh CC, Trichopoulos D. Diet during pregnancy in relation to maternal weight gain and birth size. Eur J Clin Nutr. 2004;58(2):231-7. doi: 10.1038/sj.ejcn.1601771. [PubMed: 14749741]. 17. Olafsdottir AS, Magnusardottir AR, Thorgeirsdottir H, Hauksson A, Skuladottir GV, Steingrimsdottir L. Relationship between dietary intake of cod liver oil in early pregnancy and birthweight. BJOG. 2005;112(4):424-9. doi: 10.1111/j.1471-0528.2005.00477.x. [PubMed: 15777439]. 18. Thorsdottir I, Birgisdottir BE, Halldorsdottir S, Geirsson RT. Association of fish and fish liver oil intake in pregnancy with infant size at birth among women of normal weight before pregnancy in a fishing community. Am J Epidemiol. 2004;160(5):460-5. doi: 10.1093/aje/kwh239. [PubMed: 15321843]. 19. Amorim Adegboye AR, Linne YM. Diet or exercise, or both, for weight reduction in women after childbirth. Cochrane Database Syst Rev. 2013;(7). CD005627. doi: 10.1002/14651858.CD005627.pub3. [PubMed: 23881656]. 20. Streuling I, Beyerlein A, von Kries R. Can gestational weight gain be modified by increasing physical activity and diet counseling? A meta-analysis of interventional trials. Am J Clin Nutr. 2010;92(4):678-87. doi: 10.3945/ajcn.2010.29363. [PubMed: 20668049]. 21. Muktabhant B, Lawrie TA, Lumbiganon P, Laopaiboon M. Diet or exercise, or both, for preventing excessive weight gain in pregnancy. Cochrane Database Syst Rev. 2015;(6). CD007145. doi: 10.1002/14651858.CD007145.pub3. [PubMed: 26068707]. 22. American Diabetes A. Diagnosis and classification of diabetes mellitus. Diabetes Care. 2010;33 Suppl 1:S62-9. doi: 10.2337/dc10-S062. [PubMed: 20042775]. 23. Schwartz N, Nachum Z, Green MS. The prevalence of gestational diabetes mellitus recurrence--effect of ethnicity and parity: a metaanalysis. Am J Obstet Gynecol. 2015;213(3):310-7. doi: 10.1016/j.ajog.2015.03.011. [PubMed: 25757637]. 24. Jafari-Shobeiri M, Ghojazadeh M, Azami-Aghdash S, Naghavi-Behzad M, Piri R, Pourali-Akbar Y, et al. Prevalence and Risk Factors of Gestational Diabetes in Iran: A Systematic Review and Meta-Analysis. Iran J Public Health. 2015;44(8):1036-44. [PubMed: 26587467]. 25. American Diabetes Association . Classification and diagnosis of diabetes mellitus. Diabetes Care. 2006;29:4-7. 26. Clausen TD, Mathiesen ER, Hansen T, Pedersen O, Jensen DM, Lauenborg J, et al. Overweight and the metabolic syndrome in adult offspring of women with diet-treated gestational diabetes mellitus or type 1 diabetes. J Clin Endocrinol Metab. 2009;94(7):2464-70. doi: 10.1210/jc.2009-0305. [PubMed: 19417040]. 27. Yogev Y, Visser GH. Obesity, gestational diabetes and pregnancy outcome. Semin Fetal Neonatal Med. 2009;14(2):77-84. doi: 10.1016/j.siny.2008.09.002. [PubMed: 18926784]. 28. Ju H, Rumbold AR, Willson KJ, Crowther CA. Borderline gestational diabetes mellitus and pregnancy outcomes. BMC Pregnancy Childbirth. 2008;8:31. doi: 10.1186/1471-2393-8-31. [PubMed: 18664297]. 29. Callaway LK, Prins JB, Chang AM, McIntyre HD. The prevalence and impact of overweight and obesity in an Australian obstetric population. Med J Aust. 2006;184(2):56-9. [PubMed: 16411868]. 30. Galtier-Dereure F, Boegner C, Bringer J. Obesity and pregnancy: complications and cost. Am J Clin Nutr. 2000;71(5 Suppl):1242S-8S. doi: 10.1093/ajcn/71.5.1242s. [PubMed: 10799397]. 31. Catalano PM, Ehrenberg HM. The short- and long-term implications of maternal obesity on the mother and her offspring. BJOG. 2006;113(10):1126-33. doi: 10.1111/j.1471-0528.2006.00989.x. [PubMed: 16827826]. 32. Fletcher B, Gulanick M, Lamendola C. Risk factors for type 2 diabetes mellitus. J Cardiovasc Nurs. 2002;16(2):17-23. doi: 10.1097/00005082-200201000-00003. [PubMed: 11800065]. 33. Verhaeghe J. Gestational diabetes mellitus. In: Aerts LL, editor. Diabetes and Pregnancy. 1st ed. Amsterdam: The Netherlands: Elsevier; 2004. p. 24-6. 34. Thangaratinam S, Rogozinska E, Jolly K, Glinkowski S, Roseboom T, Tomlinson JW, et al. Effects of interventions in pregnancy on maternal weight and obstetric outcomes: meta-analysis of randomised evidence. BMJ. 2012;344. e2088. doi: 10.1136/bmj.e2088. [PubMed: 22596383]. 35. 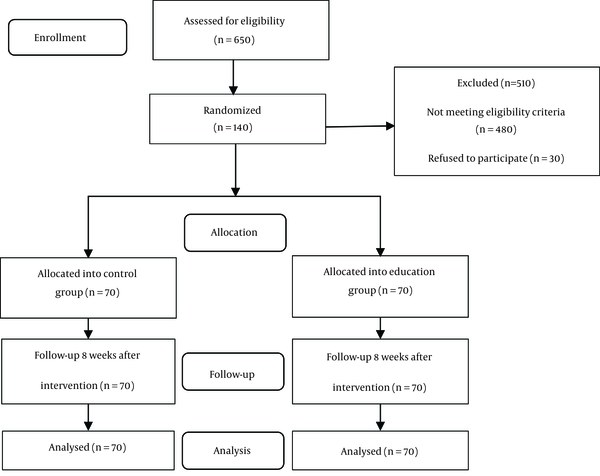 Khodabandeh F, Mirghafourvand M, KamaliFard M, Mohammad-Alizadeh-Charandabi S, Asghari Jafarabadi M. Effect of educational package on lifestyle of primiparous mothers during postpartum period: a randomized controlled clinical trial. Health Educ Res. 2017;32(5):399-411. doi: 10.1093/her/cyx060. [PubMed: 28931169]. 36. Shakeri M, Fekri S, Shahnavaz A, Shakibazadeh E. Effectiveness of a group-based educational program on physical activity among pregnant women [In Persian]. Hayat. 2012;18(3):1-9. 37. Jamalivand S, Mohammad-Alizadeh Charandabi S, Mirghafourvand M. Comparing the effect of electronic software and training booklet on maternal self-confidence and awareness about newborn care: A randomized controlled clinical trial. Iran Red Crescent Med J. 2017;19(4). doi: 10.5812/ircmj.44152. 38. Vodopivec-Jamsek V, de Jongh T, Gurol-Urganci I, Atun R, Car J. Mobile phone messaging for preventive health care. Cochrane Database Syst Rev. 2012;12. CD007457. doi: 10.1002/14651858.CD007457.pub2. [PubMed: 23235643]. 39. Kinnunen TI, Pasanen M, Aittasalo M, Fogelholm M, Hilakivi-Clarke L, Weiderpass E, et al. Preventing excessive weight gain during pregnancy - a controlled trial in primary health care. Eur J Clin Nutr. 2007;61(7):884-91. doi: 10.1038/sj.ejcn.1602602. [PubMed: 17228348]. 40. Guelinckx I, Devlieger R, Mullie P, Vansant G. Effect of lifestyle intervention on dietary habits, physical activity, and gestational weight gain in obese pregnant women: a randomized controlled trial. Am J Clin Nutr. 2010;91(2):373-80. doi: 10.3945/ajcn.2009.28166. [PubMed: 19955397]. 41. Asbee SM, Jenkins TR, Butler JR, White J, Elliot M, Rutledge A. Preventing excessive weight gain during pregnancy through dietary and lifestyle counseling: a randomized controlled trial. Obstet Gynecol. 2009;113(2 Pt 1):305-12. doi: 10.1097/AOG.0b013e318195baef. [PubMed: 19155899]. 42. Zandinava H, Sehhatti Shafaei F, Mohammad-Alizadeh Charandabi S, Ghanbari Homayi S, Mirghafourvand M. Effect of Educational Package on Self-care Behavior, Quality of Life, and Blood Glucose Levels in Pregnant Women with Gestational Diabetes: A Randomized Controlled Trial. Iran Red Crescent Med J. 2017;19(4). doi: 10.5812/ircmj.44317. 43. Garnaes KK, Morkved S, Salvesen O, Moholdt T. Exercise Training and Weight Gain in Obese Pregnant Women: A Randomized Controlled Trial (ETIP Trial). PLoS Med. 2016;13(7). e1002079. doi: 10.1371/journal.pmed.1002079. [PubMed: 27459375]. 44. Asci O, Rathfisch G. Effect of lifestyle interventions of pregnant women on their dietary habits, lifestyle behaviors, and weight gain: a randomized controlled trial. J Health Popul Nutr. 2016;35:7. doi: 10.1186/s41043-016-0044-2. [PubMed: 26911204]. 45. Wang C, Wei Y, Zhang X, Zhang Y, Xu Q, Sun Y, et al. A randomized clinical trial of exercise during pregnancy to prevent gestational diabetes mellitus and improve pregnancy outcome in overweight and obese pregnant women. Am J Obstet Gynecol. 2017;216(4):340-51. doi: 10.1016/j.ajog.2017.01.037. [PubMed: 28161306].